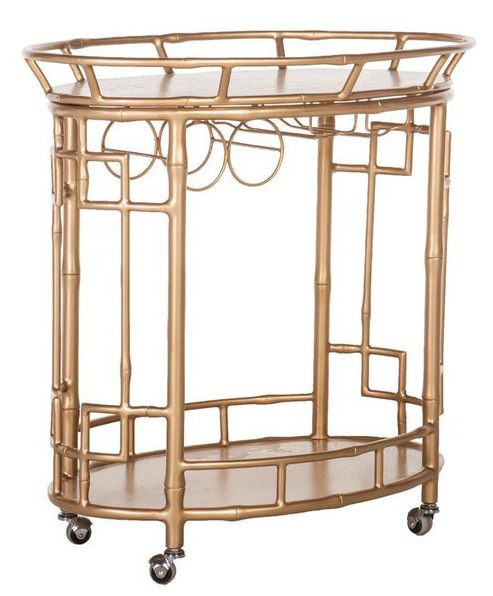 A little bar cart is a cute and fun way to recycle vintage furniture. In particular, for a lady like myself living in a small apartment, it is a multi-faceted way to make efficient use of space! 1. Bathroom: Roll up towels and stack them on the bottom rack while toiletries placed in pretty dishes and vases remain on top. Hair dryer, curler, straightener and brushes can be stored on top as well. 2. Kitchen: Silverware organized in mason jars or bottles on the top rack while bowls, plates and cups remain on the bottom for easy access. 3. Living Room: A mobile bookshelf! Stack books and magazines together on both the top and bottom shelves. Place a pretty vase of flowers on top. 4. Bedroom: Use as a nightstand with a lovely lamp on the top shelf, alarm clock, and dish for jewelry to be put in before bedtime. Have a coaster for your morning coffee or nighttime tea ready! Place make up wipes, lotions and contact solution in a hat box on the bottom shelf. 5. Dining Room: For it’s conventional use, a bar cart can be stocked with glasses and alcohol for before/after dinner/anytime drinks. Also, it can be filled with tea cups, mugs and tea fixings for a lovely afternoon tea! Check out Shell Chic’d for other ways to decorate your new favorite piece of furniture!